1. Clean all parts thoroughly in solvent and dry them with compressed air. Blow out all passages. 2. Inspect the valve body for scoring and damage. 3. Check all valves for free movement. 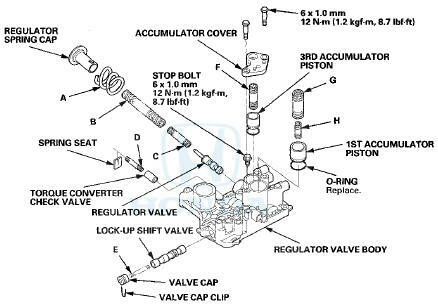 If any fail to slide freely, do the valve body repair procedure (see page 14-275). 4. Hold the regulator spring cap in place while removing the stop bolt. The regulator spring cap is spring loaded. 6. Replace the O-rings with new ones. 7. When reassembling the valve body, align the hole in the regulator spring cap with the hole in the valve body, then press the spring cap into the valve body, and tighten the stop bolt.